Simple but very tasty Pear Granola Cake with a layer of delicious pear and topped with home made granola. Perfect to surprise your guests with this fall cake. I mentioned in my birthday post that I made a cake for my colleagues; that’s what we do when we have a birthday or a name day, we make or buy some cookies, or a cake, bring it to the work…Now that I think about it, it’s really weird, I’m the one celebrating and I make cake for them…like I should make them remember my birthday. 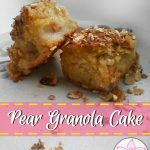 I remembered how successful my Peach Yogurt Cake was, in that instant I had the cake base in my head..Now that if you read my blog lately you know my latest addictions are pears and home made granola. So I had the idea of the twist of the cake, all I had to do is make it. Simple but very tasty cake with a layer of delicious pear and topped with home made granola. Perfect to surprise your guests with this fall cake. Heat the oven to middle-high heat. Mix the wet ingredients first in a bowl. The eggs and the yoghurt. Mix the dry ingredients in another bowl. The sugar, the flour, and the citrus peels. Mix the dry and the wet ingredients well. Grease a pan and pour half of the cake mixture in it. Peel and dice the pears. Layer it to the cake mixture, then sprinkle it with the cinnamon. Pour the remaining cake mixture onto the pears. Sprinkle the granola to the top of the last layer of cake mixture. What I most love about this cake are the layers! 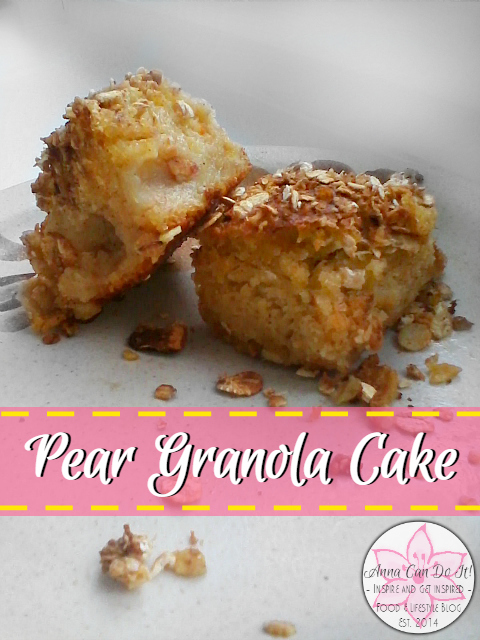 The spongy texture of the cake layers, the softness of the pears and the crunch granola on the top is just perfect! The only disadvantage is that it’s disappear so quickly! How do you celebrate the birthdays in your workplace/at home?